Leeds United head coach Thomas Christiansen, who has much to sort out. Seldom has an international break come at a better time than the latest one has for Leeds United. 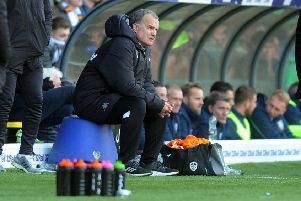 Since the last break they have fallen apart results-wise with just one blip of a win at Bristol City and a big regrouping is going to be needed if Leeds are to revive fortunes and not see their season descend into mid-table mediocrity – or worse still another possible relegation struggle. Now down in tenth the Whites are closer to the bottom three than the top of the table after they were in top spot themselves going into the last week in September. Even with United’s failings of the past decade they have rarely plummeted so fast and head coach Thomas Christiansen now appears to have a big job on his hands to turn confidence round. That is if he is allowed to take up the task with an increasing percentage of fans calling for a change on social media this week. It would be a surprise if owner Andrea Radrizzani went back on his previously public backing of Christiansen by removing him at this time, but with some tough looking matches ahead for Leeds after the break the coach’s prospects do not exactly look rosy. Just as many questions are being asked about Leeds director of football Victor Orta, who has been in charge of recruitment and has spectacularly got a number of transfers wrong. It says a lot that despite bringing in 15 players in the summer seven of the starting line-up at Brentford were at the club last season. Another, goalkeeper Andy Lonergan, was previously with the Whites and when Christiansen made changes at half-time he turned to two more players who were at Elland Road before the current regime came in. True, Orta has one brilliant signing to his name in Samuel Saiz, who along with young midfielder Ronaldo Vieira has been the only consistently shining lights in recent weeks. Vurnon Anita looks an astute free transfer as well with his ability to play in several positions, although he has yet to feature in his preferred midfield role, and Leeds have been unlucky with striker Caleb Ekuban, who picked up an injury so early in his time at the club. But signing goalkeeper Felix Wiedwald and allowing Rob Green and Marco Silvestri to leave looks a real misfire. And while there is the excuse that it can be difficult to settle quickly into English football and the hurry-scurry of the Championship bringing in so many players from the continent has clearly not worked. Forwards Jay-Roy Grot and Pawel Cibicki have looked miles away from being good enough so far, wingers Ezgjan Alioski and Hadi Sacko have only briefly shown flashes and midfielder Mateusz Klich, of which so much was expected, has fallen behind in the pecking order after failing to grab the chances he has been given so far. Loan men Pierre-Michel Lasogga, Matthew Pennington and Cameron Borthwick-Jackson, meanwhile, have been inconsistent and it is doubtful that the club would want to sign them on a permanent basis on what they have delivered so far. With still two third of the season to go there is still time for these players to prove the doubters wrong, but some evidence of this is going to be needed sooner rather than later.